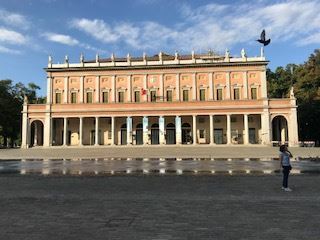 This year our educational travel group will be in Reggio Emilia, a wonderful city, located in the heart of the Emilia Romagna region. 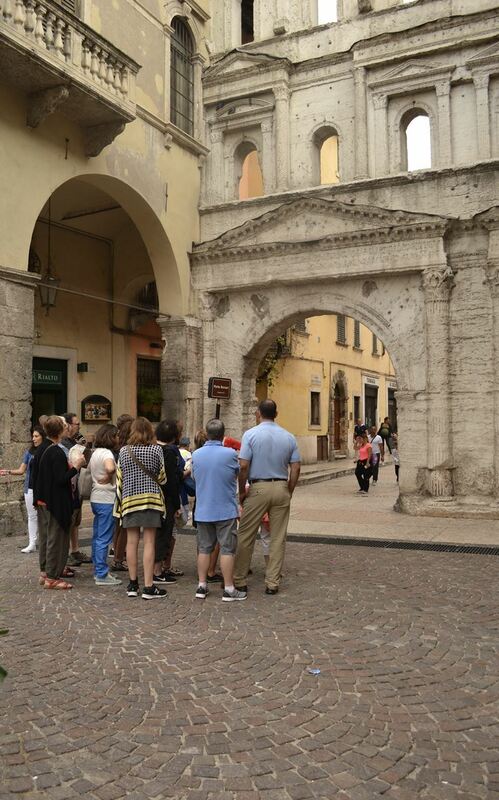 As with our previous educational trips, students enjoy learning Italian in the morning and traveling to the nearby towns and attractions in the afternoon. A two-week itinerary has been planned which will take the group through Sunday, October 7, when they return to the US. We asked our students to contribute a few thoughts and reflections of their daily experiences. They will be posted here along with a selection of photos. Follow along as they recount their adventures, inside and outside the classroom. Prior to any educational trip, participants gather together for a variety of activities. 2018 has been no exception. 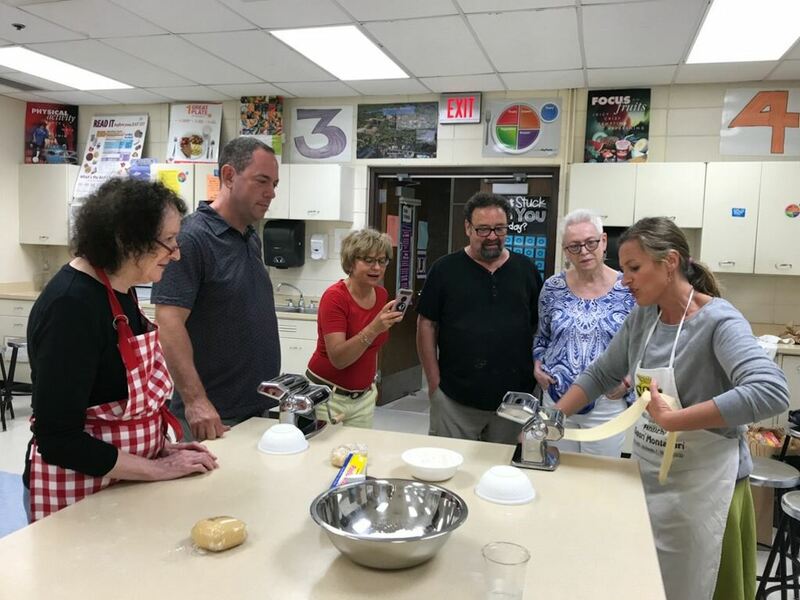 Early on, in May of 2018, ICC native Italian instructor, Romina Montanari, introduced the group to Emilia Romagna. 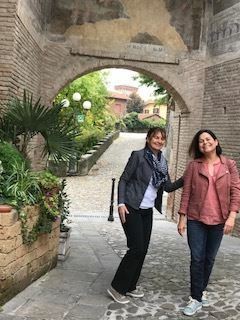 Romina grew up near Modena, and it was wonderful to learn more through Romina's personal experience. 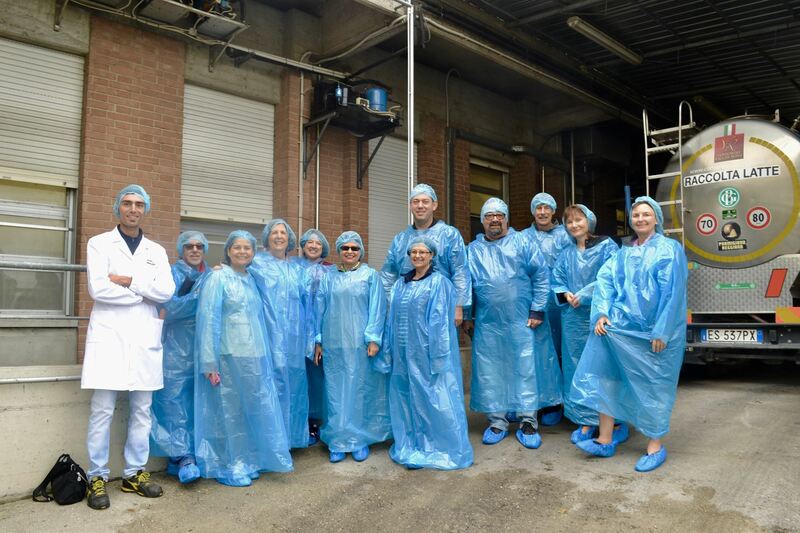 Nine of the fourteen group members came together at the ICC and enjoyed Romina's discussion, as they sampled the food and wine of the Emiia Romagna region. Then, in June, our thoughts turned towards food. 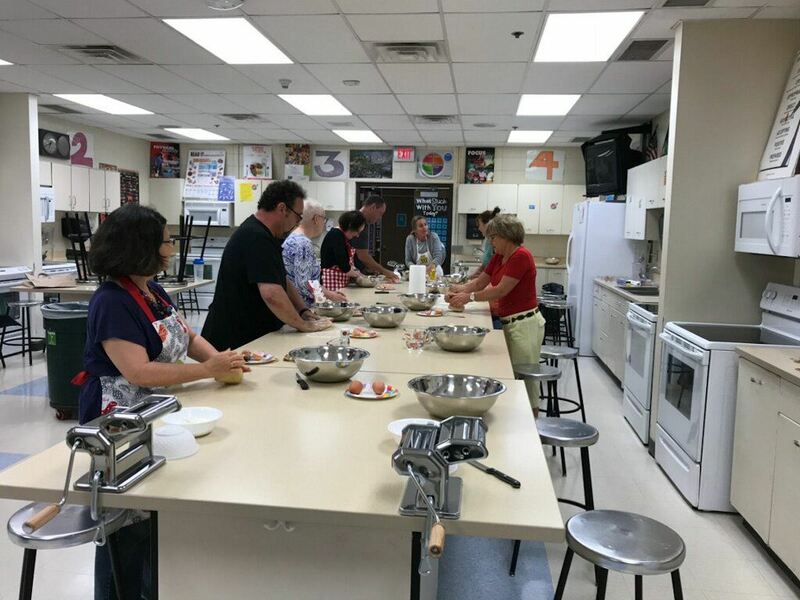 During a hands-on pasta making event, Romina lead participants in the process of making tagliatelle. Group members took their creations home, and enjoyed their tagliatelle served with various sauces. 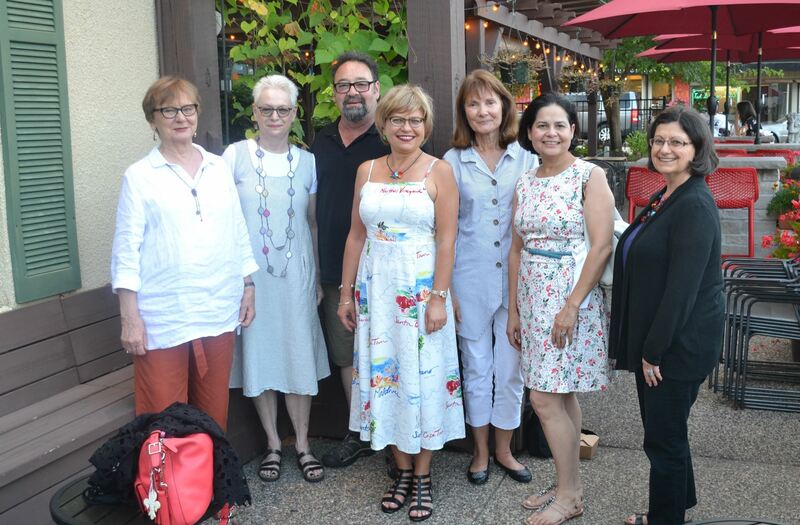 Gathering in July, group members enjoyed a delicious Italian meal at Broder's Pasta Bar. With each opportunity, everyone is getting to know one another better, and all are excited for the language and cultural experience in Italy! 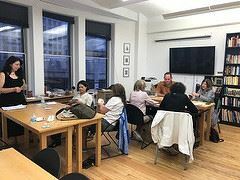 And in early September, ICC native instructor, Mirella Heimpel, spent an evening with il Gruppo Reggio Emilia, teaching group participants to play "Scala Quaranta". 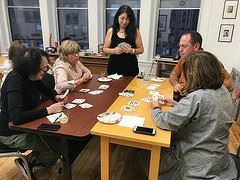 Mirella recalls this game from her childhood in Italy, and it is played in many areas of the country. Finally, il gruppo met at the airport in Bologna, on Saturday, September 22nd. It was a beautiful, sunny day as the adventure began and all settled into the hotel. The participants gathered for a pizza dinner at the local Pizzeria Pegaso. We all arrived in Reggio Emilia Saturday, Sept. 22nd, got a good night's sleep and were up early for our first adventure with Gruppo Reggio! We loaded ourselves on our private bus and off we went to Verona. 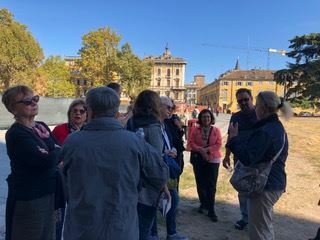 Such a beautiful and historic city, our tour guide Sarah took us to piazza Bra , the beautiful arena, Juliet's house and balcony, and Piazza della Erbe. Sarah told us a lot of extremely interesting information about Verona. 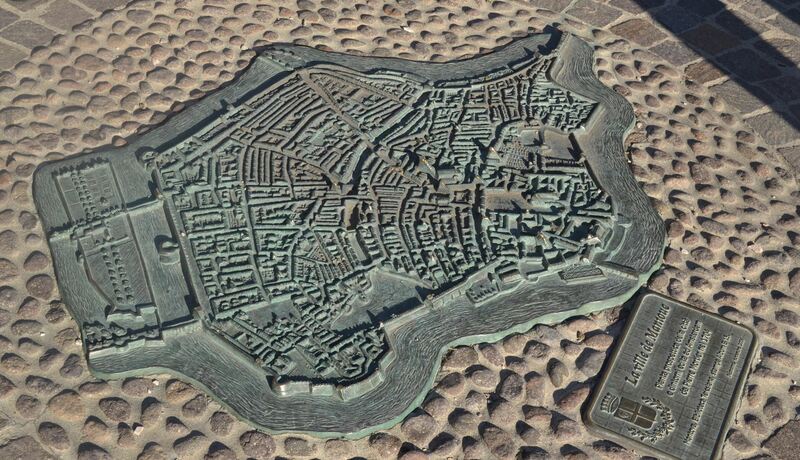 - Little did I know that in medieval times, many canals ran through the city as they did in Venice!! After a lovely lunch in a local ristorante, we enjoyed strolling through the quaint medieval village of Sirmione and a cooling walk along the shores of Lake Garda. Returning back to Reggio Emilia well into the evening, we all agreed that the day had been a rich experience and enjoyed by all!! Oh bella Italia e sua cultura, sua storia, suo tempo, sua lingva, sua musica e sua cucina e vino, sua moda e sue colori di natura che mi piace molto! 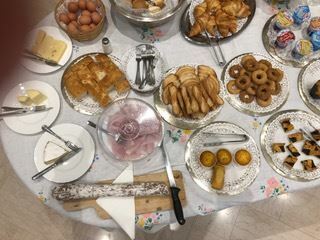 As my first trip with Reggio Emilia Group 2018 had been under the influence of severe threat of last minute cancellation and lots of stress related to my work my first day in Bologna was spent in a fight against a migraine with the only remedy possible to conquer it-long sleep in a dark and quiet hotel room. 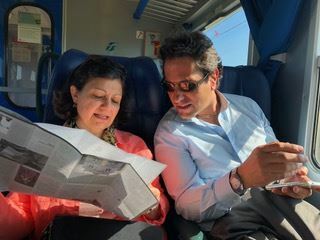 After this mission was accomplished I was ready to take on a 1/2 day exploration and adventure in Bologna with Carol and Bruce with who I traveled from Minneapolis by a lucky coincidence - and you know, that there are no coincidences in life, right? The next two hours were spent...looking for the Museum-we had the map, we asked the people on the street who gave us somewhat vague directions on campus, so we nded up at some Linguistic and Psycoligy labs, the Department of Matematics ( Italian spelling), Centro Universario Sportivo, Medicina Specialistica and Patologia, Psicologia, Archivo Storico di Departamento di Storia, Cultura e Civita, Biblioteca di Discipline Umanistishe and some other places, and we were told that the Anatomy Museum might be closed on Saturdays! I knew right on it was my favorite street in Bolgna!We finally were able to find Palazzo Poggi where the Anatomical Museum was situated -we passed by the building on the way to the campus and missed it!!! We were up for a surprise - we stepped into an old beautiful building with the School of Obstetrics Museum where the perimeter of the rooms had glass cases of displays of wax models of uterus with foetus inside them in different positions during pregnancy in 3-D models. The school of Obstetrics was started by Giovanni Antonio Galli (1708-1782), a professor of Surgery of University of Bologna in 1758, where science of chidbirth was taught to doctors and midwives adopting a method that made use of wax panels and clay models of uterus as well as instrumens that simulated the real situation of gestation. The most innovative was the performance of practical exercises using "machines" which allowed the simulation of the practice of obstetrics, which did not entail the presence of a woman in the midst of chidbirth. In the past I visited many science museums in different countries and wss expecting another type of natural sciences museum, not knowing it would be narrowed specifically to an obstetrics museum! It was incredibly interesting though, how practical approach delivering the most precious thing - life itself - was taught using very innovative methods at the time. Foe much of the 18th century Bologna was at th forefront of reproduction of wax of figures or single parts of human body. Anna Morandi (1714-1774) and her husband Giovanni Manzolini (1700-1755) produced wax models of sensory organs and uro-genital and cardio-vascular systems, and not only wax models for obstetrics for Giovanni Antonio Galli. It was cutting edge representation of models for anatomo-physiological research made for anatomysts of the Istituto della Scienza. The other part of the museum was the fortification plans and miitary archtecture - models and pictures constituted the largest collection of this type in Italy. Bruce and I skimmed the exhibition which we found very interesting, but Carol did not give it her time as it was not her favorite, and neither was the other part of the museum, but she was cool about it and was a good sport through and through. Our day was made- we learned something new, we got lost around via Zamboni, returned to the place we misssed first, got food and drinks speaking the language we love an made it on time to the airport to meet the group. And I am absolutely sure that my favorite street in the whole of Bologna is via Zamboni! Thank you Bruce and Carol for sharing this day with me - it was quite an experiance to share! Our group has finished the first week of classes at Reggio Lingua in Reggio Emilia. It has been quite a busy week with four hours of classes daily and a number of excursions often lasting into the late evening hours. 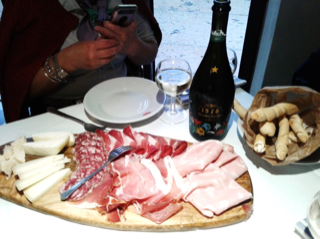 And, of course, a chance to experience a number of good restaurants both in Reggio Emilia and the surrounding areas. 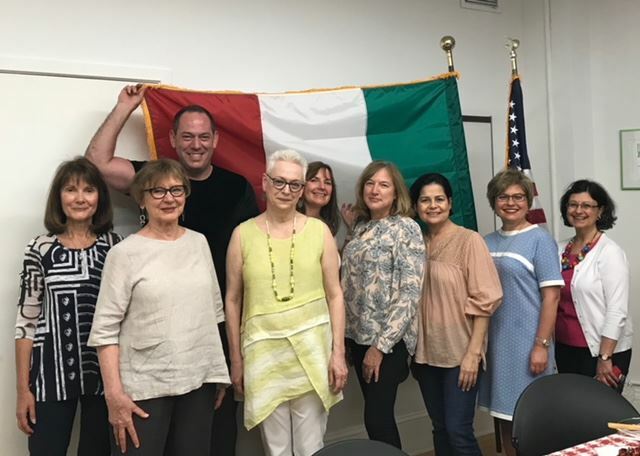 Thirteen members of our group are studying la lingua Italiana. We are basically divided into three groups based on ability levels that were determined through online testing provided by the school. One person has a private lesson for part of the morning then joins the group for the second half of the lesson. The school is located close to the hotel, Albergo Morandi, where we are staying about a five minute walk at the most. It is located on the third floor of a small office building, with three classrooms, the directors' office and a small common area. Our lessons are divided basically into two parts. Instruction in Italian grammar based on each group's level and conversation. 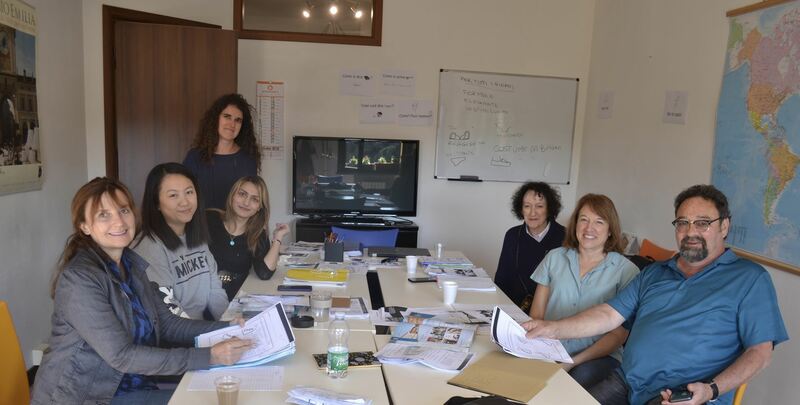 All the instructors are native born Italians with experience in teaching Italian to foreign students. All are very well versed in their subject matter and give excellent instruction as well as just being outgoing and delightful. 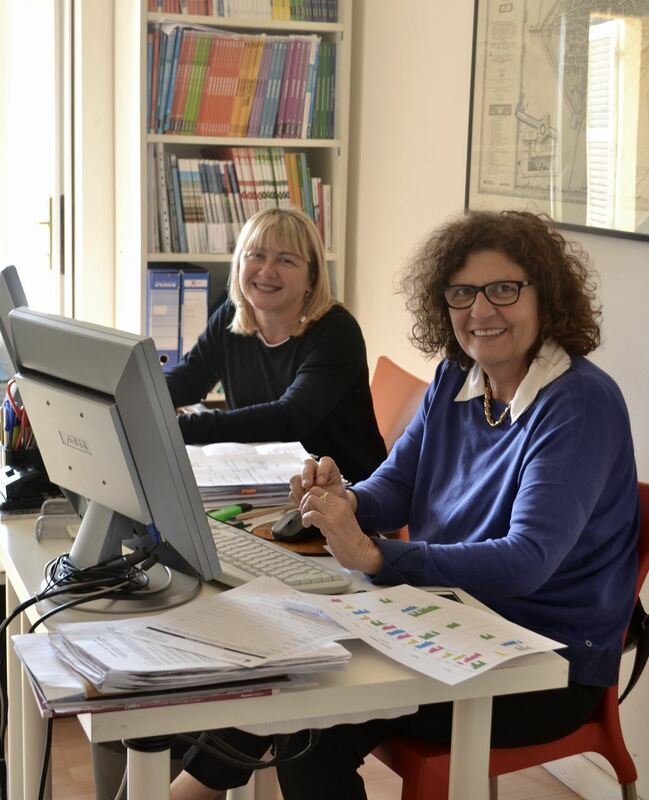 A very busy weekend looms ahead before beginning our second week in Reggio Emilia as well as our second week of classes. A week with various excursions and continued instruction building on what we have already learned. The day starts at 7:15 with a quick shower and trunk downstairs for a well appointed colazione. There is much to chose from. Then it is off to scuola for 4 hours of lessons. Today was a special day as it was Janice’s Birthday and we enjoyed tasty treats at break time. After a quick lunch on our own we made it to the train station for a trip to Parma. Luckily, we all have an amazing sense of direction so there was no confusion as to where to go. On the train we made helpful friends like Roberto. In Parma we were led by our most wonderful guide, Lucia. See, we can behave and march along in an orderly fashion. But don’t look too close. You may see more than you bargained for. 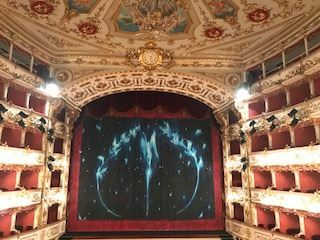 Lucia took us to the Teatro where we saw a rehearsal for Macbeth, part of a Verdi festival in Parma. Amazing. 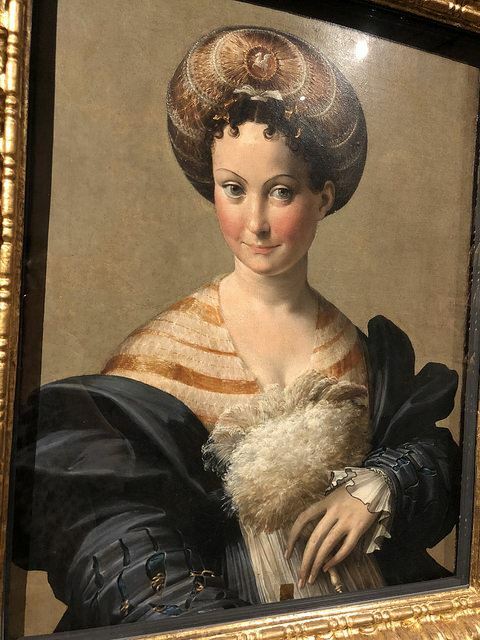 And to the art gallery where there were many pieces by Correggio. I am now a fan. And the Duomo where we saw Correggio’s painted ceiling of Christ ascending to Heaven. After dinner we tiredly headed back to the train station. 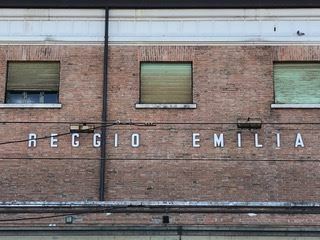 As italian cities go, Reggio Emilia lacks the hustle and bustle of the larger cities and, in contrast, is low key and relaxed. And then there’s the countryside. After class on Thursday we boarded a city bus and 20 minutes later we were in the country. Our destination was La Razza, an agriturismo, where we would have a cooking class and lunch. As we meandered toward our destination, we enjoyed grapes from the vineyards and the sights and sounds of the very contented farm animals. A bit about about agriturismos. They are working farms that offer travelers the opportunity of a stay in the country and the pleasure of enjoying meals of the fresh food produced on the farm. It’s a growing segment of tourism in Italy. 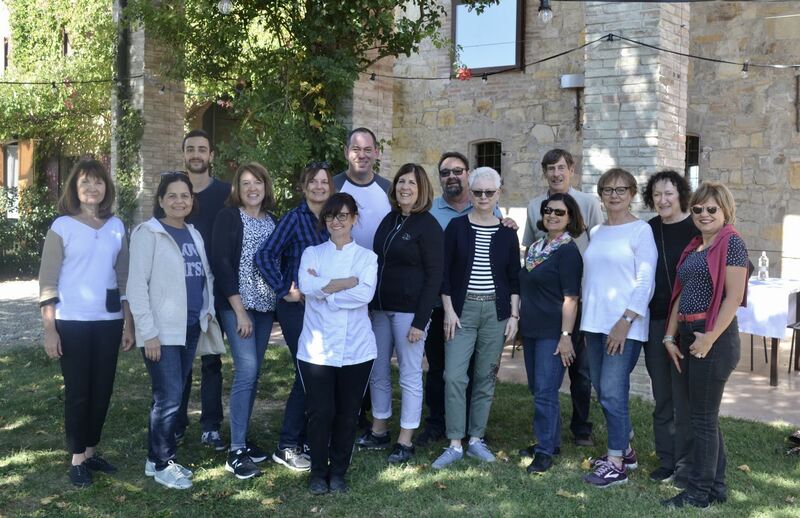 When we reached La Razza we were greeted by Terri, our hostess, and taken to a work area set up for preparing pasta all’uova, an egg pasta that could be used to prepare a number of different shapes and types of pasta. We soon developed a deep respect for Italian cooks. It was hard work — and we made a mess! 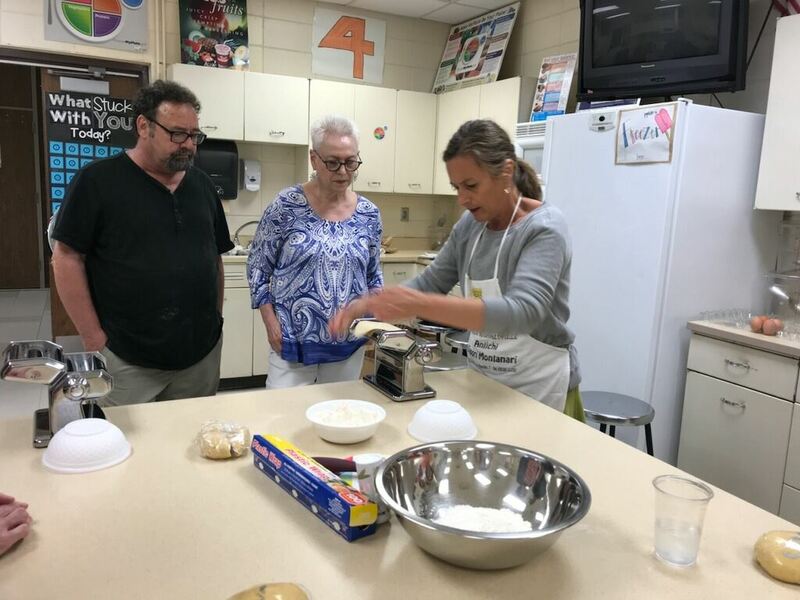 Next Terri demonstrated how to make the filling for tortellini spinach and ragu di verdure, a simple, flavorful pasta sauce. Finally we attempted tortellini al forno, a rich, buttery dolci with prune marmelata filling. This was the Mt. Everest of our cooking experience. Terri kindly told us that it takes many years to achieve success. Despite our ineptitude we had a great time. The highlight of the day was lunch set outside under the trees. It was an expertly prepared version of our attempts. Un perfetto giorno. The STUDENTI tour today (Saturday/SEPT 29) was MOLTO BELLA. 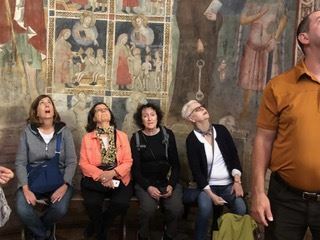 It started with an 8am departure on a comfy mini-bus northward to MANTOVA (in the Lombardy province), a historical CITTA snuggled between 3 lakes which are the result of the waters flowing south from Lago Di Garda. Our fantastic, knowledgeable guide met us as our bus arrived...was eager to share her enthusiasm on the special sites (along with sidebar stories of the historical families)which are designated UNESCO World Heritage. 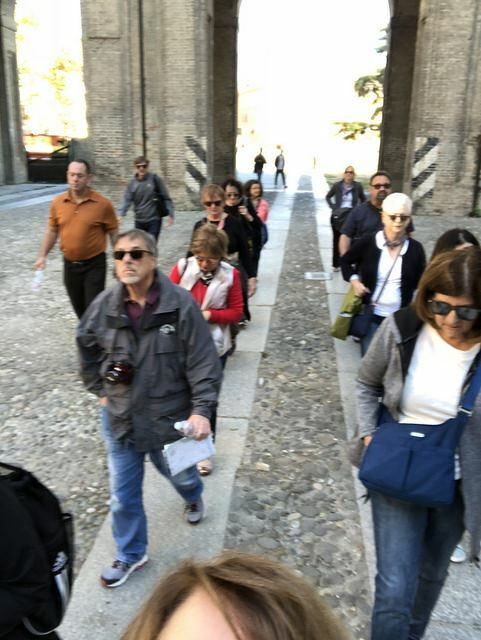 The day was filled with plenty of beauty: crisp blue sky, bright sun, and no shortage of STONES—from the chunky cobbled-patterned streets to the fortified stone PALAZZO DUCALE, which is surrounded by its own personal moat. This site is the highlight! Our tour guide lead us through the museum area of the PALAZZO with it’s ornate rooms, valuable artifacts, statuary, and artwork, and frescoed walls. The CENTRO of Mantova is brimming with more Baroque, Gothic, Neo-classical architecture...all the keys sites are easy to visit with a stroll. The largest PIAZZA was buzzing with families, kids, cyclists, and tourists…a lively place to people-watch or grab a caffe. A mid day PRANZO (lunch)was enjoyed by all at a local TRATTORIA. A bit of free-time after dining to poke around the streets and peek into shops. To top off the late afternoon, there was a second bus tour to a picturesque village of BORGHETTO along a steady-flowing river (icy waters coming from the Alps/Lago Di Garda). Here the partial remains of a historical roman gate PONTE VISCONTEO flank you as you drive thru. Dominating the highest bluff overlooking the village is IL CASTELLO SCALIGERO,which can either be reached on foot (steps to climb for 20 minutes thru a shady forest) or via a small mini-tourist trolly train. It’s a cheap ticket to be allowed into the CASTELLO to wind up the stairs of 2 of it’s towers for dramatic vistas. Back in the village there are tourist shops, cafes, and very pretty views being enjoyed by day-tripper tourists and local families enjoying a weekend outing. SPECTACULAR! We have had quite an action-packed weekend, going around to beautiful northern towns. Today was Ravenna, which is quite a long voyage from Reggio Emilia, as it is just south of Venice, but it has sights to behold. It has some of the most beautiful and important mosaics in the world. There are eight UNESCO world heritage sites in this small city alone. It was also the capitol of three major empires: the Western Roman empire and the Ostrogothic and Byzantine Kingdoms. It is a not-to-miss place that is often off the average tourist radar. So, we and thousands of other above-average tourists descended upon the city for on a beautiful, warm autunno Sunday. 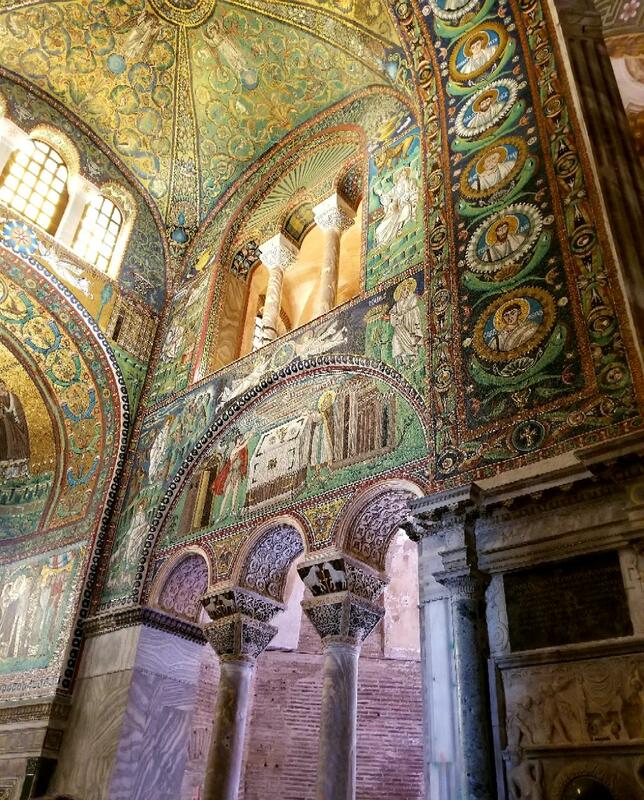 Our lovely and informative tour guide Marialaura showed us around the 4th and 5th century buildings, incredibly preserved and covered inside with intricate, sparkling glass and marble mosaics and frescoes. We also saw the tomb dedicated to Dante Allighieri. There was some speculation as to whether his remains are really there, as Firenza has a tomb as well. Are his remains there? Who knows? Maybe he's under home plate in Giants Stadium. We had ample time to wander town after lunch. There was a neat farmer's market in the main area of town, strewn across several blocks under porticoes that line many buildings. We had an early rise on a Sunday morning to make this excursion, but it was well worth it. A little about my class, as the classes are the thing I am most frequently asked about, with this now being my 3rd trip with the ICC. We are split 3 separate classrooms. I am in the advanced group with 3 others. Our instructor is phenomenal. We spend 4 hours together each weekday morning. Most of the class is structured conversation. We talk about culture, some politics, likes and dislikes. 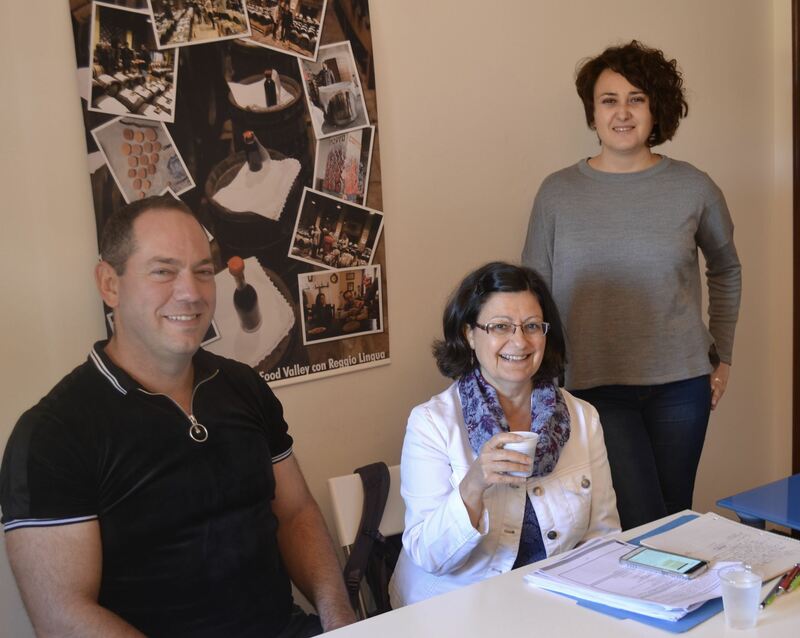 Our instructor provides feedback on our grammar and pronunciation and seems very keen to areas in need of work among the 4 of us, around which she focusses her lessons. We spend an hour or 2 on structured exercises of subjects like congiuntivo. I was disappointed to discover that I had been using congiuntivo a bit wrong before. However, I met up with a native friend in Bologna on a free afternoon and he explained that many Italians use it wrong. In fact, the president often makes news for his inability to use it correctly. So, maybe after these two weeks, I can say that I speak better Italian than the president. Today is Monday of the second week. Sadly, the time is flying by but most of us are becoming comfortable with the language. We gathered early at 8:00 am and took the public bus to a Parmesan cheese factory. Consorzio Vacche Rosse. It is a co-op of farms that produce milk for this production facility. The cows of this special facility are all Rosso, Red! Era molto interessante. Twice a day, 12 hours apart, the milk is delivered to the facility. It is closely controlled so that they can track the wheels of cheese right back to the date, time, and origin of the farm. The evening milk arrives and is allowed to separate over night into skim milk and cream. The skim milk is used for the cheese and the cream is sold to other butter processing plants. In the morning the skim milk is combined with the whole milk delivery from the morning. The base formula of the parmigiana cheese is 500 kilos of skim 500 kilos of whole milk and 25 kilos of whey. For two hours it is stirred and ultimately turns into a ball of cheese that can be put into forms that form the wheel. It is turned every two hours and pressed to eliminate the moisture. The next step is 20 days in a salt water bath where the salt absorbs into the wheel of cheese. It remains in the salt for 20 days. They produce only 20 wheels per day! The astonishing thing is that the cheese artisans must work 365 days a year. The cows produce milk every day so they work everyday! The cheese is then stored for 24-26 months, 16-18 months for aperitivo and perhaps as long as 12 years. The wheels darken with age, each weighing about 92 pounds. They are tested and turned throughout the process and only the perfect wheels get to be called PARMIGIANA REGGIANO. Adesso andiamo alla scuola per il pomeriggio. 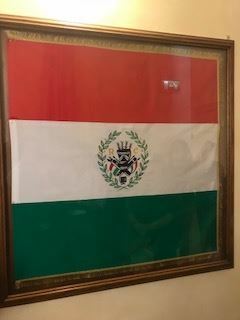 Our third day in Reggio Emilia we met our tour guide who showed us The Sala Tricolore Museum to learn how the green, white, red colors of the Italian flag came to be. The colors have been in use since the 1700’s. The modern flag became the country’s official flag in 1948. 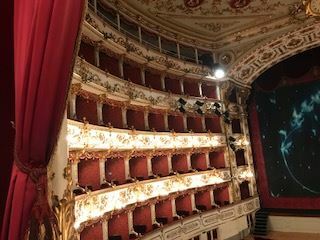 Next stop: In 1857 the Teatro Comunitativo(City Theater) was opened. 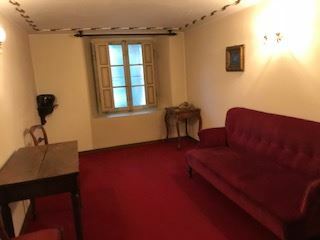 As is customary in Italian theaters it has a public reception area, auditorium & stage. The architect was Cesarean Costa from Modena. The auditorium has a horseshoe-shaped plan. There are four tiers with a total of 106 boxes and proscenium boxes. All box furnishings are original! There is an elegant Royal Box. The three stage curtains are beautiful. Two of the three curtains were painted from 1855 to 1857. The 3rd curtain is modern and made in 1991. 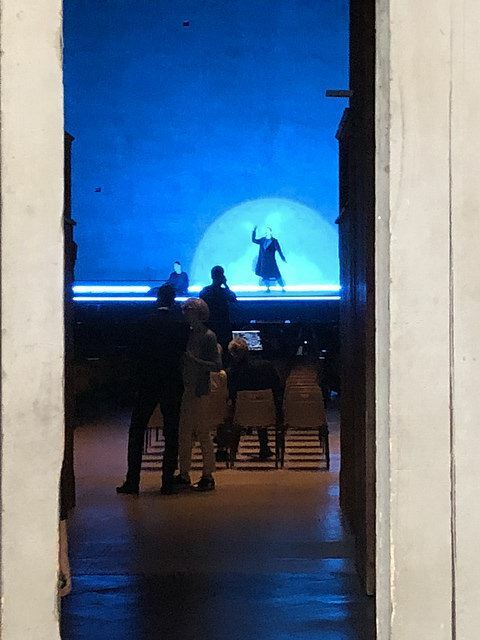 The stage is one of the largest in Italy and the stage floor has a slight inclination which allows you to see all of the performers. One of the more interesting things we learned & saw were the rooms behind the boxes on the other side of the walkway that led to the boxes. Those rooms had locks on their doors. While the wives were sitting in their boxes enjoying the opera their husbands were entertaining (smoking, drinking, playing cards & who knows what else) in the individual private rooms across the walkway. Those rooms also had stairs from which people could come up from the lobby without anyone seeing them. Life back in the 1800’s. Amy, Jane e Io siamo andate a Castellarano, un piccolo paese miedevale a 30 km da Reggio Emilia dove ci sono molte fabbriche di ceramica . Abbiamo visitato la chiesa di Santa Maria Assunta. Il Castello e abbiamo fatto shopping alle uniche boutique che abbiamo trovato aperte. Era un bel posto per fare una passeggiata sul fiume . Finalmente, abbiamo sete e abbiamo preso un aperitivo a un cafe e ci siamo rilassate. Dopo siamo ritornate a Reggio e siamo andati a mangiare alla pizzeria Piedigrotta con il gruppo . Il cibo erano molto buono. Lo consiglio. These are the last days of ICC’s Gruppo Reggio Emilia trip. 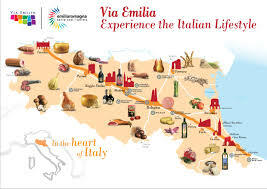 It has been a wonderful experience to study and travel through the Emilia-Romagna region of Italy together. 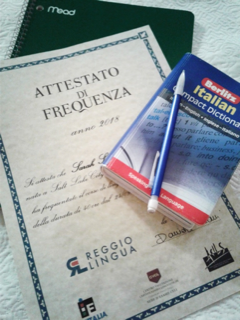 We graduated from our Italian classes Friday after 2 weeks of intensive study. Thank you, Reggio Lingua for adding so much to my knowledge of the language. 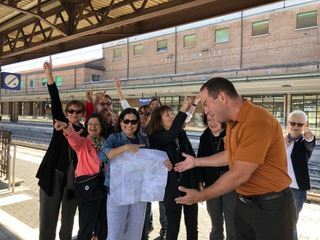 After school, several of us made the short train ride to Modena. Some went to the Ferrari Museum. 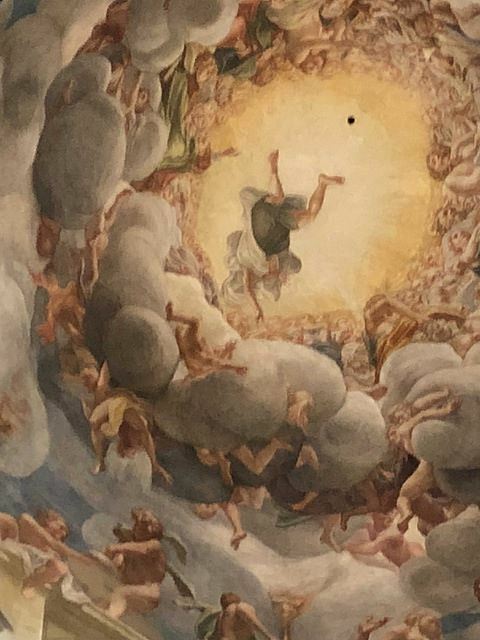 I went to the Galleria Estense to see Italian paintings from the 14th to the 18th century, collected primarily by the House of Este. It is an extensive collection that I recommend seeing. 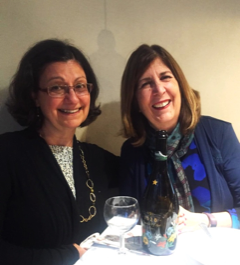 We ran into two classmates, then wandered upon the Osteria di Modena Rossi in the Piazza di Roma. 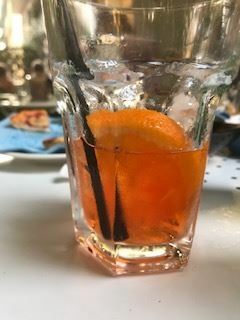 It was still early – not even 6:00 pm – but they agreed to serve us aperitivo. We shared a delicious charcuterie plate, wine, and a sweet plum crostata. 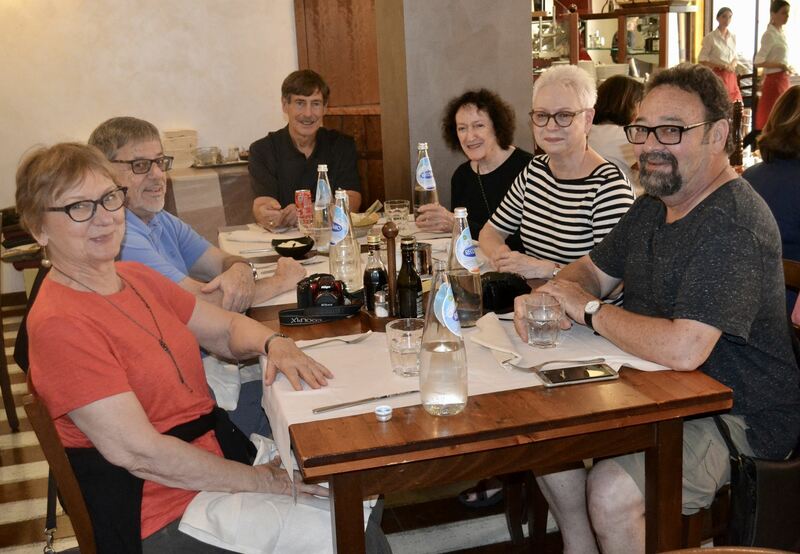 Moments like these are what I remember when I’m back in Minnesota in winter – relaxing with old and new friends in some piazza, having Prosciutto di Parma and Parmigiano-Reggiano accompanied by a nice glass of prosecco. Another great day in Bella Italia!